The following article or section contains guides. The strategies presented may not be the only ones or the best ones. The Emperor's Realm is the final cavern in Challenge Mode in Pikmin 2. The common enemies the player will fight are Grub-dogs and Breadbug mimics. The level can be hard due to the dangerous creatures, and could end in a failure if one doesn't watch the Pikmin and the time. Note: The previous object numbers were gathered from a very basic reading of the game's files. Research is currently underway to get more accurate numbers. A Red Bulborb will probably be next to the starting point. If it's tucked in the wooden structure, ignore it, as it won't wake up when your Pikmin pass with treasure. The Hairy Bulborb has the key. Make your way to it, and toss your Purple Pikmin onto its back. After retrieving the key, you may explore the rest of the cave for treasure. Beware of the fire geysers. If you're unlucky, the Spotty Bulbear will notice you from the start. Try to lure it into the starting point, being wary of the fire geysers, and use an ultra-bitter spray on it. If the Dwarf Bulbears follow the Spotty Bulbear, you may need to throw some Pikmin onto their back before taking on the petrified Bulbear. If you're lucky, no Pikmin will die. Retrieve The Key and you can now head over to the exit. See also: Fiery Bulblax strategy. Throw Blue Pikmin onto the Queen Candypop Buds when their color is red. The goal is to have several Red Pikmin with you. Once you're ready and cleared most of the fire geysers near the starting area, dismiss everyone and wake up the Fiery Bulblax with a punch from your leader. Be careful not to get too close when punching, as you could get burned. Attract the Bulblax to the starting area. It'll cross the water and be extinguished, but that's not the point. It'll cross land again and reignite, and when it comes to a certain point near the starting area, it'll give up and turn back. When it does, call your Red Pikmin and petrify it. Have your Red Pikmin attack it and retrieve The Key. To save on sprays, you can instead lob Purple Pikmin to stun it, but beware – they will catch on fire and/or start drowning. Either way, you can use the eggs in the level or the nectars dropped by the Bulblax (if any) to flower your Pikmin. See also: Empress Bulblax strategy. Just as the level starts, quickly gather your Pikmin and head for the Empress Bulblax. Quickly throw some Pikmin onto its head, but don't move the group, or else some Pikmin will swarm its central body and most likely will get killed. After some time, the Empress will shake your Pikmin off. Be sure to call them before it does. Any Bulborb Larva it had spawned will likely be squashed. While the Empress is rolling, you may want to take down the fire geyser to your left. When it stops, repeat the same strategy. You have time, so don't rush it. Once that's done, one or two larvae might survive, so take them out with a punch from a leader. See also: Emperor Bulblax strategy. From the start, if you head forward, you'll find three bomb-rocks. Try to wake up the Emperor Bulblax in front of these bomb-rocks. Attract it towards them, and once it tucks in its tongue, preparing to stick it out, go gather your Pikmin. While it's dazed, throw Pikmin onto its face. 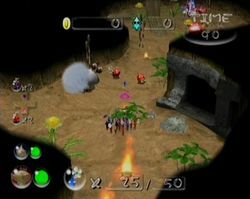 Be careful when moving the group, as you might make some Pikmin attack the remaining bomb-rocks. When it wakes up, have it eat either one or both of the other bomb-rocks, and attack it again. This Bulblax will likely contain the key, but if not, repeat the strategy with the other Emperors. This page was last edited on April 11, 2018, at 20:39.